For a minute or two she stood looking at the house, and wondering what to do next, when suddenly a footman1 in livery2 came running out of the wood  (she considered him to be a footman because he was in livery; otherwise, judging by his face only, she would have called him a fish)  and rapped loudly at the door with his knuckles3. It was opened by another footman in livery, with a round face, and large eyes like a frog; and both footmen, Alice noticed, had powdered hair4 that curled all over their heads. She felt very curious to know what it was all about, and crept a little way out of the wood to listen. The Fish-Footman began by producing5 from under his arm a great letter, nearly as large as himself, and this he handed over to the other, saying, in a solemn tone, "For the Duchess. An invitation from the Queen to play croquet." 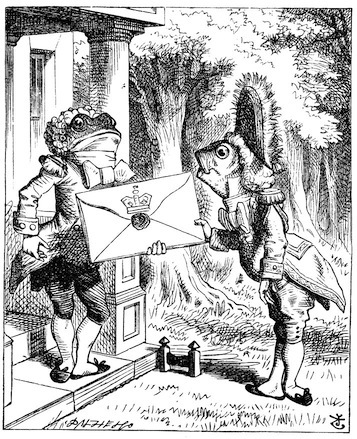 The Frog-Footman repeated, in the same solemn tone, only changing the order of the words a little, "From the Queen. An invitation for the Duchess to play croquet." Alice laughed so much at this, that she had to run back into the wood for fear of their hearing her; and when she next peeped out, the Fish-Footman was gone, and the other was sitting on the ground near the door, staring stupidly up into the sky. "There might be some sense in your knocking," the Footman went on, without attending to her, "if we had the door between us. For instance, if you were inside, you might knock, and I could let you out, you know." He was looking up into the sky all the time he was speaking, and this Alice thought decidedly uncivil. "But perhaps he ca'n't help it," she said to herself; "his eyes are so very nearly at the top of his head. But at any rate he might answer questions.  How am I to get in?" she repeated, aloud. "I shall sit here," the Footman remarked, "till to-morrow "
At this moment the door of the house opened, and a large plate came skimming out, straight at the Footman's head: it just grazed his nose, and broke9 to pieces against one of the trees behind him. " or next day, maybe," the Footman continued in the same tone, exactly as if nothing had happened. It was, no doubt: only Alice did not like to be told so. "It's really dreadful," she muttered to herself, "the way all the creatures argue.10 It's enough to drive one crazy11!" The door led right into a large kitchen, which was full of smoke13 from one end to the other: the Duchess14 was sitting on a three-legged stool in the middle, nursing a baby15: the cook was leaning over the fire16, stirring a large cauldron which seemed to be full of soup. "There's certainly too much pepper17 in that soup18!" Alice said to herself, as well as she could for sneezing. "Please would you tell me," said Alice, a little timidly, for she was not quite sure whether it was good manners21 for her to speak first, "why your cat grins like that?" "It's a Cheshire-Cat22," said the Duchess, "and that's why. Pig!" "I didn't know that Cheshire-Cats always grinned; in fact, I didn't know that cats could grin." Alice did not at all like the tone of this remark, and thought it would be as well to introduce some other subject of conversation. While she was trying to fix on one, the cook took the cauldron of soup off the fire, and at once set to work throwing24 everything within her reach at the Duchess and the baby  the fire-irons25 came first; then followed a shower of saucepans, plates, and dishes. The Duchess took no notice of them even when they hit her; and the baby was howling so much already, that it was quite impossible to say whether the blows hurt it or not. "Oh, please mind what you're doing!" cried Alice, jumping up and down in an agony of terror. Oh, there goes his26 precious nose! ", as an unusually large saucepan27 flew close by it, and very nearly carried it off. "If everybody minded their own business," the Duchess said, in a hoarse growl, "the world would go round a deal faster than it does." "Which would not be an advantage," said Alice, who felt very glad to get an opportunity28 of showing off a little of her knowledge. "Just think what work it would make with the day and night! You see the earth takes twenty-four hours29 to turn round on its axis "
Alice glanced rather anxiously at the cook, to see if she meant to take the hint; but the cook was busily stirring the soup, and seemed not to be listening, so she went on again: "Twenty-four hours, I think; or is it twelve? I "
"Here! You may nurse it a bit, if you like! "34 the Duchess said to Alice, flinging the baby at her as she spoke. "I must go and get ready to play croquet with the Queen," and she hurried out of the room. The cook threw a frying-pan after her as she went, but it just missed her. Alice caught the baby with some difficulty, as it was a queer-shaped little creature, and held out its arms and legs in all directions, "just like a star-fish," thought Alice.35 The poor little thing was snorting like a steam-engine when she caught it, and kept doubling itself up and straightening itself out again, so that altogether36, for the first minute or two, it was as much as she could do to hold it. As soon as she had made out the proper way of nursing it (which was to twist it up into a sort of knot, and then keep tight hold of its right ear and left foot, so as to prevent its undoing itself)37, she carried it out into the open air. "If I don't take this child away with me," thought Alice, "they're sure to kill it in a day or two. Wouldn't it be murder to leave it behind?" She said the last words out loud, and the little thing grunted in reply (it had left off sneezing by this time). "Don't grunt." said Alice; "that's not at all a proper way of expressing yourself." The baby grunted again, and Alice looked very anxiously into its face to see what was the matter with it38. There could be no doubt that it had a very turned-up nose, much more like a snout than a real nose: also its eyes were getting extremely small for a baby: altogether Alice did not like the look of the thing at all. "But perhaps it was only sobbing," she thought, and looked into its eyes again, to see if there were any tears. No, there were no tears. "If you're going to turn into a pig, my dear," said Alice, seriously, "I'll have nothing more to do with you. Mind now!" The poor little thing sobbed again (or grunted, it was impossible to say which)39, and they went on for some time in silence. Alice was just beginning to think to herself, "Now, what am I to do with this creature, when I get it home?" when it grunted again, so violently, that she looked down into its face in some alarm. This time there could be no mistake abut it: it was neither more nor less than a pig, and she felt it would be quite absurd for her to carry it any further. So she set the little creature down, and felt quite relieved to see it trot away quietly into the wood. "If it had grown up," she said to herself, "it would have made a dreadfully ugly child: but it makes rather a handsome pig, I think." 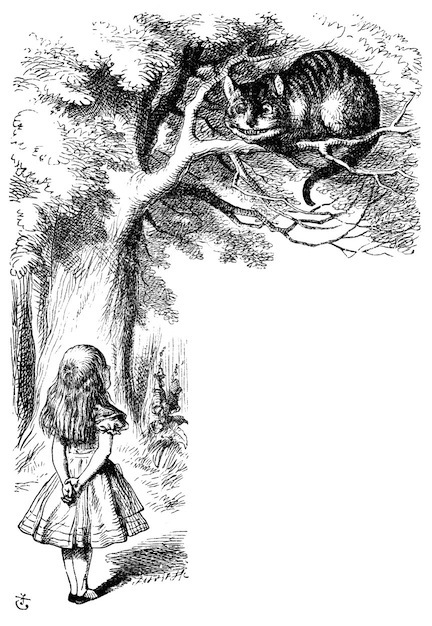 And she began thinking over other children she knew40, who might do very well as pigs, and was just saying to herself "if one only knew the right way to change them " when she was a little startled by seeing the Cheshire-Cat sitting on a bough of a tree a few yards off. "Cheshire-Puss," she began, rather timidly, as she did not at all know whether it would like the name: however, it only grinned a little wider. "Come, it's pleased so far," thought Alice, and she went on. "Would you tell me, please, which way I ought to go from here?" "I don't much care where " said Alice. " so long as I get somewhere," Alice added as an explanation. "Oh, you're sure to do that," said the Cat, "if only you walk long enough." Alice didn't think that proved it at all: however, she went on: "And how do you know that you're mad?" "Well, then," the Cat went on, "you see a dog growls when it's angry, and wags its tail when it's pleased.46 Now I growl when I'm pleased, and wag my tail when I'm angry.47 Therefore I'm mad." "Call it what you like," said the Cat. "Do you play croquet with the Queen to-day48?" Alice was not much surprised at this, she was getting so well used to queer things happening. While she was still looking at the place where it had been, it suddenly appeared again. "By-the-bye,50 what became of the baby?" said the Cat. "I'd nearly forgotten to ask." "It turned into a pig," Alice answered very quietly, just as if the Cat had come back in a natural way. Alice waited a little, half expecting to see it again but it did not appear, and after a minute or two she walked on in the direction in which the March Hare was said to live. "I've seen hatters before," she said to herself: "the March Hare will be much the most interesting, and perhaps, as this is May, it wo'n't be raving mad  at least, not so mad as it was in March." As she said this, she looked up, and there was the Cat again, sitting on the branch of a tree. "Did you say 'pig', or 'fig'?" said the Cat. "I said 'pig," replied Alice; "and I wish you wouldn't keep appearing and vanishing so suddenly: you make one quite giddy51!" She had not gone much farther before she came in sight of the house of the March Hare: she thought it must be the right house, because the chimneys were shaped like ears and the roof was thatched with fur.52 It was so large a house, that she did not like to go nearer till she had nibbled some more of the left-hand bit of mushroom, and raised herself to about two feet high53: even then she walked up towards it rather timidly, saying to herself "Suppose it should be raving mad after all! I almost wish I'd gone to see the Hatter instead!" A footman, as may be gathered from the word and the role of our fishy friend, is a term for a male servant hired to run errands and do various chores. There is also a piece of now rarely used furniture called a footman, a brass stand that would be placed by an open fire. Dishes were placed on this type of footman to keep warm. It's likely that a common chore for a footman would be to keep an eye on the dishes waiting on this stand to make sure they didn't overheat and bring them to the table when called for. Livery being a non-military uniform of any sort. Many of us have likely seen if not directly encountered livery when worn by cab drivers, hotel greeters, or the local mailperson. This is actually quite a come down for livery, which formerly meant the status of holding land given by the english king, from which it came to refer to the different logos and banners carried by knights at tournaments. Those logos and banners are better known as 'coats of arms' today, and originally the servants of a titled houshold would have worn the coat of arms as part of the clothes provided for them to wear by the titleholder. This is actually quite a surprising thing for the footman to do. Most doors in the victorian period, especially in the case of the doors attached to the houses of well-off families, had a door knocker. That is, the front door would have a sort of ring on a hinge attached to it, usually with a metal striker plate that the ring would be struck against to make a racket and get someone to come to the door. They are still widely available, and are now inexpensive enough that anyone can have one on their front door, barring limitations due to the structure of the door or rules like those in condominium and apartment complexes. 'Powdered hair' referring in fact to powdered wigs. Wigs were a common item of apparel before the french revolution, worn by men and women alike. The better wigs were made with human hair, and contrary to popular belief were not generally white. Preparing a wig for wearing involved making certain that it was well pomaded, then briskly dusting it with wig powder, which was often cornstarch. The pomade would hold the powder on the wig, and although the cornstarch was often left undyed, stylish wearers could apply yellow, pink, or blue powder as well. The original 'powder room' was actually a room dedicated to preparing wigs in this fashion, since it was a messy process. Men were the main wig wearers, with women usually opting for hair extensions and additional hair pieces instead. A particular drawback of wigs was that they could become infested with lice just as real hair could, which would lead to a nasty surprise if you bought a wig secondhand, as people certainly did. After the french revolution however, wigs fell precipitously out of fashion. As a verb, 'produce' means literally 'to lead or bring forward' which is why you can be directed to produce witnesses. It isn't often used in the sense of 'to bring something out' in english today. Practically speaking, it's hard to imagine whether such a hair disaster could occur in real life, especially now when most wigs are made with the same stuff as that stuck into the heads of dolls. Of course, this being an absurd story, Lewis Carroll can have the footmen's wigs get as tangled as he likes! So apparently at this strange household, a footman is required to stand with his head pressed to the door so as to hear anyone knock at all! The most common definition of a dish refers to items you eat off of or serve food in. Since they are usually made of glass or earthenware unless they are camping dishes, it's relatively easy to imagine dishes breaking. But as it turns out, the definition of a kettle is not so universal, although there seems to be general agreement that they are probably just dentable. Specifically, if you are a tea drinker, a kettle is probably the item you put on the stove or plug in to boil water. If you are not a tea drinker, the kettle you know best may be a metal pot with a lid used to cook by stewing or boiling. At least in my experience, the second definition would be referred to as a pot. Why Alice would want to go into a place with such an infernal racket going on inside it is a matter to wonder at. I choose the term 'infernal' with tongue in cheek, as this house seems to sound quite hellish, to go with the apparently paradisiacal garden Alice is determined to visit. 'Respectable' englishpeople were ostentatiously religious in the victorian era, and Lewis Carroll was a clergyman as well as a mathematician when he wasn't writing peculiar stories for children, as has already been noted. Frogs have nostrils but not noses in the sense of bony protruberances. They do most of their breathing through their skin since they are amphibians, and therefore still close to fishdom. This isn't to say that frogs don't have lungs, however. They have two small lungs that they empty and fill by opening or closing their nostrils and/or mouths while either raising or lowering the bottom of their mouths. As indeed frogs seem to do, when in their more usual habitat. The frog sitting on a lillypad, occasionally catching a fly or ribbiting is a staple of woodland imagery  George Lucas even threw the image into Star Wars. John Tenniel's illustration lends itself to utter confusion at this point, because it shows a kitchen with a closed stove-oven, presumably heated by wood or coal. Unless the stovepipe opens into the kitchen it's a puzzle how there could be smoke everywhere. The imagery in the text actually better fits a medieval-era kitchen, which would have had a large open fire with the main stew or soup cooking in a cauldron and/or a joint of meat on a spit cooking over it. That could easily fill a kitchen with smoke if the chimney flue was mismanaged. It would also suit the implied hellish imagery a bit better. All that said, perhaps the image of the cook stirring a giant cauldron was considered too frightening for children by then, contradictory as that may seem. 'Duchess' is a woman holding a title to a region that she rules on behalf of the ruler who granted her the title. The term may also be applied to the wife of a duke, a duke being the male version of the title. Considering how like a man in drag the Duchess looks in the illustration at left, we should probably be thankful that 'nurse' can refer to simply holding and rocking a baby as well as suckling one. It's an alarming thought to imagine a baby in such an awful environment, but there's a twist to come. As already noted, the cook is indeed leaning over a fire, stirring a cauldron. A cauldron would be singularly useless on a stove like the one in the picture, due to its three legs. As anyone familiar with an electric or gas stove knows, once you have flat burners to heat food by, the pot has to be flat-bottomed as well. 'Pepper' is a rather loosely used term today, used to refer to anything that when eaten leaves a hot sensation in the mouth, as well as to a whole range of vegetables that may not be spicy at all. The original pepper comes from southern india, and derives from a berry. The berries are dried, giving us the familiar black 'corns.' 'White' pepper has had its outer skin removed by processing after drying. Other colours of pepper kernels are created by treating the pepper berries differently after drying. The burning sensation that comes from eating pepper is caused by chemicals called capsaicins. As veteran pepper eaters know, water doesn't help that sensation since the capsaicins are carried by oils, and oil and water don't mix. There is such a thing as 'pepper soup' that uses chiles and black pepper, a west african dish that isn't necessarily hot at all, at least to West Africans and anyone else accustomed to eating it. In any case, it would be difficult to sneeze due to the soup unless you were standing over it. Reading this story again as an adult, it is at this point that I'm forced to declare this chapter probably the least pleasant in the book. There's nothing especially entertaining in the image of a baby suffering in this way, and it adds to the disgust factor that nobody seems to care much except for Alice. Note also the reference to the baby as an 'it' terminology that no self-respecting parent would tolerate for an instant today, although 'it' was considered an acceptable pronoun for a baby until surprisingly recently. I attended a communication course last year where everyone was learning how to deliver bad news in a way that didn't invoke utter panic or fury. One of the other participants had to be gently reminded that referring to any child as 'it' in such a circumstance would be the verbal equivalent of a bomb. Oddly enough, he was an older british gentleman. Cats do in fact 'grin' from ear to ear, as can be seen from examining the shape of their jaws and observing any cat when they yawn. Part of what gives a cat an apparently constant grin is the shape of its upper lip, which unlike the upper lip on a person is still bifurcated. Some babies are born with a 'cleft lip' which is not an atavism but a birth defect that may range from minor to severe enough to lead to corrective surgery. In all likelihood, it would not be 'manners' for a child to speak to an adult with a title first, but this being hell's kitchen and Alice's sense of the hierarchy being askew, she may as well be bold. Cheshire is an English county famous for its cheese, and also Lewis Carroll's home county. There is an as yet unsubstantiated explanation for the Cheshire Cat as deriving from a picture on the labels of Cheshire cheeses, or the impression of a cat's head set in the cheese. 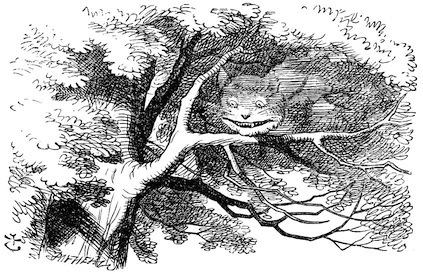 The term 'grinning like a Cheshire cat' is older than Alice in Wonderland, although its origins are still contested. This seems to be a bit more to establish the Duchess as an unpleasant character, although it could be considered a bt of crude foreshadowing. Things get nastier and nastier; we'll just have to assume that the only things the cook could reach in the kitchen were things like spoons, soup dishes, pots, and bowls. Then again, that may be why the cook is working on a soup, since to those unfamiliar with cooking it could easily seem like you just throw things in the pot, no slicing or chopping required. This is an ironic scene in its own way, though. Servants are far more likely to be abused by their employers than vice versa. Today the job category of 'domestic servant' is still one of the least regulated in north america, with little enforcement of the requirements that people in these jobs, primarily women, should have breaks and days off. 'Fire-irons' are seen less and less often today, although they can still turn up in expressions like 'I have irons in the fire.' They are the tools used to tend the fire in an old fashioned fireplace, usually including a small brush, dustpan, tongs, and a poker. They can be quite elaborate, made of cast iron with their own specially made stand. 'Fire iron' may also be used to refer to the iron posts used to hold up cooking pots or meat over an open fire. Could Alice tell if the baby was female or male just by looking at them? In the victorian era, not necessarily. All babies were dressed up in what seems today to be surprisingly frilly, lacy stuff until they could walk well, when they would be dressed effectively as miniature adults. The victorian era was also a high point for prescriptive grammarians, who were still engaged in an effort to enforce the pseudo-generics 'man', 'he', 'his', and 'him' to refer to any person not explicitly marked as male or female. A saucepan, as might be expected, is a smaller one handled pot used for cooking gravies and sauces. The word 'sauce' comes from the Latin 'salsus' meaning salted, salt being one of the earliest means of dressing food, gravies and the like. This hardly seems an opportunity for showing off knowledge at all, what with flying objects, billowing smoke, and an apparently furious cook. It's even more surprising that Alice would be inclined to take the risk of showing off a little, in view of the previous results of similar attempts. The Earth's period of rotation is currently measured at 23.934 hours, but this is actually a few minutes shorter than what we usually refer to as a day. The rate of the Earth's rotation is slowing down due to gravitational interactions with the Moon, leading to the addition of a leap second at the beginning of 2009. Leap seconds may be added at the end of June or the end of December, and are determined in part by matching the definition of the length of the Earth's day measured by an atomic clock against its physical behaviour. And yes, in ordinary life, a leap second is a profoundly pointless thing. Luckily Alice is at no risk of decapitation, as we have already learned that with the cook having thrown everything she can get her hands on at the Duchess, there are definitely no axes, knives, or any other sharp or pointy objects barring the fire irons anywhere in the immediate area. By now it goes without saying that shaking a baby is an extremely bad idea, as this could cause severe injury. 'Tis full of anxious care! Nice as the sentiment may be, it still astounds me that anybody willingly wrote and published such schlock. And it's so nauseatingly nice that apparently this inspired the nastiness of this kitchen scene  except, actually, it isn't nice at all, as Gillian Beer points out in her introduction and notes to Jabberwocky and Other Nonsense. The repeated refrain "speak gently" sounds ever more sinister, especially once the note that the child may not long be with us is read. An interesting and non-sinister quirk of Lewis Carroll's parody is that its metre fits the motif of the 'Ode to Joy' in Beethoven's 9th Symphony. This may sound hard to believe, but I can truly vouch for this because when I first learned to play that motif in music class, I was astonished to discover I was playing the tune for the Duchess' song. It's a coincidence of course, and probably comes from the happenstance of english being a germanic language plus the parody and the poem by Hiller having the same metre. 'Ode to Joy', or 'An die Freude' in german was written by Friedrich Schiller, and it is quite compatible with the flowery to syrupy range of 'Speak Softly', although its message is not as homely or edgy (it's astonishing that both terms apply). The Schiller Institute gives the following English translation of 'An die Freude', including the footnote. Be embrac'd, ye millions yonder! Every man becomes a brother." Here we learn that Alice would have made a fine rugby player as with no warning and objects hurtling around her, she catches the hapless baby. Five-ness is actually fundamental to many life forms on Earth, starting with vascular plants. Roses and apples provide especially famous examples of this, becoming religious symbols including the stylized roses in church windows and the pentagram. In animals, the most famous fives tend to correspond to number of limbs including the tail; in humans and other primates there are ordinarily five fingers on each hand and five toes on each foot. It's pretty much impossible to imagine what this could look like, which is probably just as well. 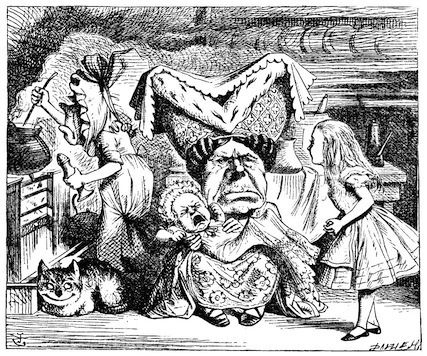 If Lewis Carroll seriously considered grunts and sobs similar sounding, it may have been for the best that men in his time were generally expected to have next to nothing to do with infants. Which is not to say babies can't grunt, and it shows the lack of practical knowledge of baby care of both author and character that Alice didn't look to check the baby's diaper on hearing a sound reminiscent of one from her new friend. This thought is quite unworthy of Alice, but quite fascinating from a story perspective. Lewis Carroll would have been quite familiar with the Odyssey, the famed epic by Homer about the meandering trip Odysseus took home from the greek war on Troy, meandering primarily due to his own greed and arrogance. One of his stops was at the island of Aiaia, where he and his crew had an alarming encounter with Kirke, who was able to turn men into animals, in his crew's case, pigs. Odysseus avoided this fate and rescued his crew from it. 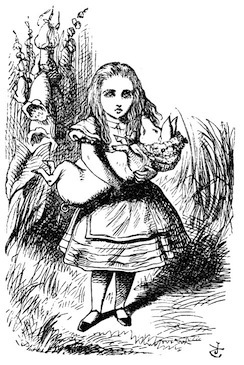 Here Alice in her own journey to get to the garden she wants to walk in rather than look at with one eye encounters and rescues a pig who was captured and transformed into a baby by the rather sinister Duchess. Hatters being people who make and sell hats. 'Mad as a hatter' is an expression now well-known to derive from the neurological symptoms suffered by hatters who used mercury to process beaver pelts into felt. All that said, as the writer of the WIkipedia article on the Hatter points out, anger and general obnoxiousness are not behaviours consistent with the effects of mercury poisoning. By rights the Hatter should have been timid and self-effacing, and the version of the Hatter in Tim Burton's film Alice in Wonderland tends to the timid and self-effacing with moments of quite different behaviour that seem to be mainly a way to manage Johnny Depp's penchant for overacting these days. 'Mad as a March Hare' in turn refers to the behaviour of hares during their breeding season, which runs from February to September in Europe. Apparently the hares behaved in what struck people as an exceedingly strange manner, with unexpected leaps and bouts of boxing, the latter in fact being female hares chasing off male hares. This suggests a whole manner of places that people go to that can be taken as evidence that they're insane, provided they share the salient features of the Duchess' alarming house with its kitchen apparently being entered straight through the front door. A battlefield comes to mind. Granting assumptions is one of the most dangerous possible actions when faced with someone attempting to make an argument by inference. The type example in western example is the Platonic dialogue, where Socrates traps those he converses with into particular conclusions by convincing them to accept seemingly obvious statements as facts. At least in Plato's depiction of him, Socrates was so outstandingly good at this, and such a bore when people he spoke with caught on to what he was doing and refused to allow him to control the conversation, that it was hard for others to believe that he wasn't behaving in a fundamentally cynical manner. The end result is that after a number of basic exchanges, the 'dialogues' reduce to Socrates speaking, leaving periodic pauses for the other people to say, 'yes,' 'certainly, 'indeed,' 'quite right' or ask a daft question or make a strawman argument for him to knock down. Being too wise by now to simply accept the Cheshire Cat's reasoning, and being a cat lover, Alice isn't going to simply accept a dog's behaviour as the baseline definition of sanity in household pets. One of the many weirdities of humans is the fact that baring the teeth can indicate happiness in some instances, where in all other animals that do so baring the teeth is an expression of aggression. Scientists still haven't really figured out how cats purr, although all cats do, including the cats we're accustomed to seeing as powerful predators of the savannah and the jungle. The current explanation is that cats are able to vibrate muscles in their voice box to create the purring sound that house cats have learned turn susceptible humans into devoted caretakers for life. As noted previously, 'to-day' used to be two words, old english 'to daege' meaning 'on this day.' It kept its hyphen right into the twentieth century, when it was dropped in part because if 'to' is read as the preposition, the combination makes no sense. As noted in the last footnote to chapter one, croquet is a curious game, usually depicted as a genteel affair in period dramas. At first glance it looks like someone really wanted to golf, but had no clubs and was debarred from digging holes in the lawn. What they did have was apparently broken polo mallets, snooker balls, and endless time on their hands. The game was brought to england either from ireland or france. According to Wikipedia the irish origin is more likely, and following the golf analogy the origin would be neatly reflective of the fact that in many places ireland's soil is quite shallow. Television may depict croquet as a genteel game, but it has a wide reputation for being a competitive game with plenty of opportunities to argue. Never having played it or watched a game, I can't speak to this reputation, although I do wonder if it relates to the fact that it is played with mallets. 'Giddy' is often taken to mean giggly or foolish, and has 'rustic' connotations. It's another old english word, and it originally meant 'mad, crazy, stupid.' Uncontrollable laughter is popularly associated with madness (pace the Joker of Batman comic book fame), but today its usual definition is 'affected with vertigo' its most likely meaning here. Thatching is very nearly a lost art in 'western' countries, as the makers of the movie version of 'The Lord fo the Rings' discovered a few years ago. It involves making bundles of dried hay or other suitable grass to cover a roof, such that water is unable to drip or leach into the building. They are actually quite durable when put together properly, and may well make a serious comeback as asphalt shingles become more difficult to come by. As we know from the end of the previous chapter, Alice approached the Duchess' house at a height of about nine inches. The Duchess' house is about four feet high, so the March Hare's house must be at least twice as tall.